Pete Bessone was elected into the United States Hockey Hall of Fame in 1978. Bessone’s brother, Amo, also played for the Reds and later became a USA Hall of Famer himself. 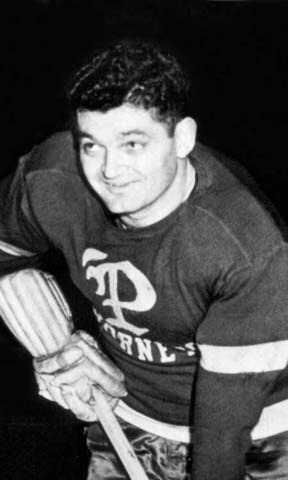 Pete played with Providence in 1946 towards the end of his professional career. He scored 4 goals and 9 assists with 94 PIM in 54 games. Bessone was a three-sport star at West Springfield High School in Massachusetts. In 1931, he left the United States to play hockey in France, enjoying a very successful career overseas. He came to be considered such a top draw in France, the locals referred to him as the “Babe Ruth” of hockey in Paris. Now believed to be a top prospect, he signed on with the Detroit Red Wings and played 6 games with them in 1938. They would turn out to be his only NHL starts. He played 3 seasons with the Cleveland Barons, the high point being their 1944 Calder Cup.